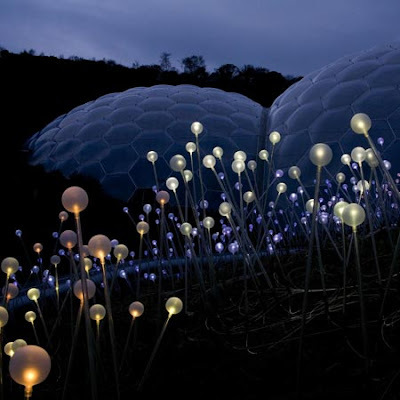 Lighting designer Bruce Munro has completed 'Field of Light' installation at the in Cornwall, England. The lighting installation situated on the grass roof of the visitors center, called the Link building, between the famous Rainforest and Mediterranean Biomes. 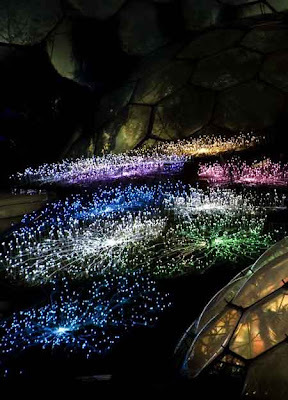 It's made of 6,000 acrylic stems, through which the fibre optic cables run and each is crowned with a glass sphere. The sculpture slowly changes color, transforming from blue to pink, yellow, green and back to white. When a miniature version was exhibited in the Pirelli Garden at the V&A in 2004, the sculpture first came to widespread public attention. 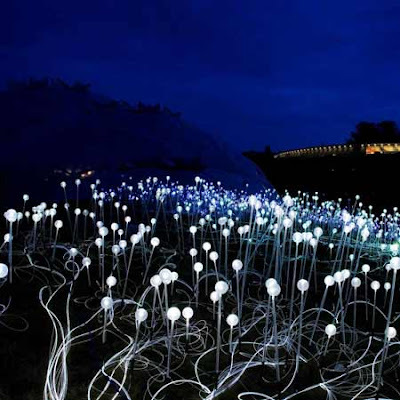 The installation covers an area of 60 x 20 meters, using 24, 000 meters of fibre optic cable. It's best viewed after night and will stay in place until spring 2009.